Ecological tours in national parks of Kazakhstan. "The park owes its clean, fresh air to these woodland trees - which in turn has granted it a reputation as a health resort, together with its mild climate and soothing scenery. Small guesthouses, hotels and holiday camps are scattered everywhere, but in spite of this there is plenty of pristine landscape still remaining, and even during the high season between June and September there are plenty of places to find peace and solitude"
Borovoye, now renamed Burabay lies over 200 kilometres to the northeast of Astana and almost 100 kilometres to the south of Kokshetau - which by Kazakh standards makes it very accessible. It's a name that is treasured by all Kazakhs, referring not only to the famous lake that lies in the middle of the mountains, but to the whole Burabay-Kokshetau National Park. As per the Resolution of the Government of the Republic of Ka­zakhstan as of August 12, 2000, the State National Park (SNP) Burabai was founded under the Business Admin registration of the RK President to pre­serve the unique natural complex, historical and cultural monuments, rare, endangered and important species, and to diversify utilization of natural, historical and cultural ob­jects of the Borovoye resort zone. The State National Park total area comprises 83, 510 hectares. The Burabai SNP is an environmental in­stitution and it is situated on the specially protected natural territories with unique natural monuments. The State National Park Burabai consists of the Tshuchinsk-Borovoye zone and over 76 recreational facili­ties: sanatoriums, preventive clinics, recreation and retreat centres, holi­day camps, hotels, etc. On the whole, the territory boasts a developed net­work of motorways, rehabilitation and recreation facilities. Mountain landscape, spruce for­ests, fresh air, lakes, rich hydromin­eral resources, such as radon waters of the Zelenoborskoye springs, bro­mide brines of the Maibalyk springs, therapeutic muds of the Balpashsor, drinking iron-rich and iodide-bro- mine mineral waters on the adjacent territory, are very important health factors. Natural and climatic conditions, rich hydromineral resources of the Tshuchinsk resort area make it pos­sible to compare this place to many European balneological and moun­tain climate resorts of Italy, Austria, Germany, Switzerland, France, and Romania. The resort's principal salubrious factors include: nature, air, sunbathing, healing beverages (kumis and shoubat), mineral waters and therapeutic muds. The combination of mineral waters, therapeutic and other salubrious fac­tors have a beneficial effect and ensure proper rest. Geographical location of the Tshuchinsk-Borovoye area facilitates the development of tourism - ecotour- ism, ethnocultural, health, water and sport, etc. Other kinds of recreation that could be offered to tourists are hot-air balloon rides, wildlife watching, cycling tours, automobile tours, city (shopping), water and underwater, floristic tourism, etc. Only 630 square kilometres in size, it is one of the country's smaller nature reserves. Burabay is dominated by its clear, spring-fed lakes, and the deciduous ash and birch forests that surround them (the Russian name Borovoye signifies a landscape covered by Bor; or "little forest"). The park owes its clean, fresh air to these woodland trees - which in turn has granted it a reputation as a health resort, together with its mild climate and soothing scenery. Small guesthouses, hotels and holiday camps are scattered everywhere, but in spite of this there is plenty of pristine landscape still remaining, and even during the high season between June and September there are plenty of places to find peace and solitude. September is considered the best month to visit Burabay: the birch trees are turning a fantastic golden-yellow, the swarms of mosquitoes have disappeared, the water in the lakes is still warm enough for swimming and there is space in the guesthouses. Moderate temperatures invite long walks and climbs up the bizarre-looking rock formations. One of these, in the shape of a camel lying down, gave the area its Kazakh name: Burabay, meaning "rich in camels". There is, of course, a legend connected with the Burabay rock: once upon a time there lived a beautiful white camel that would change its shape whenever an enemy approached, fly onto the mountain and warn the people with loud bellows. In this way, it protected the local population from danger. One day, however, the camel was on its way to the waterside to drink when it met the hunter Kasym Khan, who considered the fine animal merely as game and shot an arrow at it. The wounded beast began to bellow and sank to its knee, while still trying to reach the watering place, but the merciless hunter kept shooting arrows at it and mortally wounded it. The camel never reached the waterside, died on the spot and turned into a stone hill, from that day forward known as bura, or camel. These days, hunting is strictly forbidden, and 223 different species of bird and 54 different species of mammal inhabit the national park. The legend of the region's formation tells how God granted the Kazakhs this wonderful landscape after they had complained about the scanty steppes, which had been allotted to them during the world's creation. Roaming through the forests and climbing up to vantage Points to take in the view, it's easy to imagine the Kazakhs of old, believers in the spirits of nature, coming together on this holy spot and wondering how these formations had come into existence with their shapes of camels and fortresses, witches and sleeping knights. It is only natural that each peculiar rock formation should be given its own magical tale of origin, such as the following: In an aul there once lived a batyr who knew no fear. When the Zhungars invaded the area one day, the batyr called upon his peers to march against the enemy with him, but none heeded his call, since feuds between the various tribes prevented them from acting as one. Therefore, the young warrior took his horse, put on his helmet and battle gear and marched towards the battlefield on his own. He lost his eyesight in the fight, was severely injured but never once backed away. Inevitably, he could not hold out against the overwhelming enemy host on his own, and when finally his mighty body collapsed, the batyr sank into an eternal sleep. There he lies to this very day, in the forest of Borovoye, his face towards the sky. From a great distance one can discern his profile while looking at the hill called Zheke Batyr - the Sleeping Knight. If you want to spend some time in Burabay during the summer, make sure you make your reservation well in advance, since all accommodation is usually fully booked weeks or months ahead of time. In comparison to other areas in Kazakhstan, Burabay is well developed; not only are there parking areas and campsites, but the walking trails have even been signposted. The most popular destination, Lake Borovoye, can be circumnavigated at a leisurely pace in a single day. Circular in shape, it boasts many bizarrely shaped - and named - rocks, from Zhumbaktas ("Unresolved riddle", but also called the Sphynx) to its nearby counterpart Okzhetpes ("Unreachable for arrows"), as well as the Three Sisters and the Bastion. A climb up the rocks between Lake Borovoye and Bolshoye Chebachye is rewarded by a wonderful view over the two lakes. Climbing the highest peak in the area, Mount Kokshetau, is not an easy venture. It is very rocky and, relatively low as it is, the difference in altitude should not be taken lightly. But the view from the summit is breathtaking, and apart from the lakes already mentioned, you can also look out over the Maloye Chebachye salt lake, the picturesque lake of Shchuchinsk and a multitude of smaller steppe lakes. The view also includes the Camel and the Sleeping Knight. Hikers in good condition can walk around the lakes of Bolshoye and Maloye Chebachye in a single day. It takes half a day to walk to the beautiful forest lake of Katarkol and its eponymous village. The multitude of children's holiday camps, however, does not make this walk a quiet one during the summer. Lake Borovoye is the most popular for swimming, with a lovely pebble beach under age-old pine trees. To be alone, try escaping to Lake Bolshoye Chebachye. The water is crystal-clear, and there are hidden bays that can only be reached from the rocks above. The view towards the east differs greatly from that of Lake Borovoye. From here, you are looking out over flat, unforested plain. This is steppe in its most classic form. The eastern shore of Lake Shchuchinsk and almost the entire shore of Lake Zhukey on the southeastern border of the park are also good for swimming. 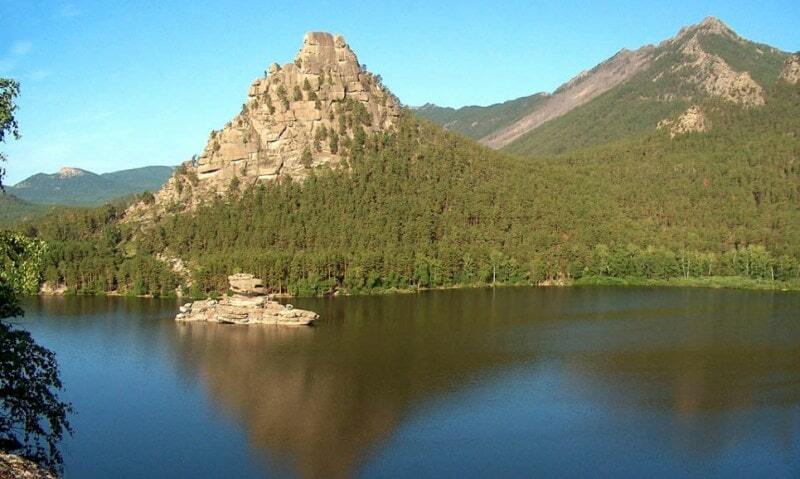 The latter is situated to the east of the forest-covered Mount Berkut, which is easy to climb. Its opposite shore, however, is completely unforested. Since 2008, at Kilometre 9 on the Borovoye-Zhana Talap road there has been a Siberian red deer (cervus elaphus maral) farm. Here, in Bugy-Burabay devotees of unusual healing methods can undergo a deer horn cure (see Special Topic on 422). A little - known secret is the small lake of Karasu (Karashye in Russian), located two kilometres to the northeast of Lake Shchuchinsk. The president has a remote, idyllic holiday home here - proving he definitely knows where his country is at its most beautiful. The government has chosen Lake Borovoye to be the site of one of three major tourist developments, to be built as part of a major tourism plan.